We had a great time at the usual Webheads weekly chatfest last night. Nelba is thinking to organize a blog camp in Argentina and has put it on the agenda for our next weekly chatfest (Dec 30, 2007, noon GMT at http://www.tappedin.org and WiZiQ), Bee is filling her sabbatical with an itinerary of such events starting with one like this one http://www.icvet.tafensw.edu.au/ezine/year_2007/dec/report_elearning07.htm, and which she describes more thoroughly here: http://groups.yahoo.com/group/evonline2002_webheads/message/17432; and of course there were overtones of multicultural holiday foods and music. Many people seem to appreciate the 'musical gift' Dennis offered here: http://www.d-oliver.net/Happy-Holidays-2007/Webheads/ (hope he's got trackback in; he'll see that I've linked to his post!). Heather made a posting to one of the lists I follow in which she said that she was considering using Facebook with her students, and did anyone have any thoughts on how she might do that. Someone was quick to respond with a posting citing a litany of paedophilia encounters on social networking sites. The posting was perhaps meant as a warning about such sites, but was more likely a case of someone passing on something they had seen lately on the topic, though they didn't know much more about it than that. I responded that this was exactly the reason WHY educators SHOULD be taking an interest in social networking sites like Facebook. Some commonly cited analogies are that you don’t keep scissors out of your classroom, you teach people not to run with them. What if adults 'blocked' streets and tried to keep children from crossing them instead of teaching them HOW to cross them? Sure, the kids would be safe for a while, if a bit ignorant, but eventually they would encounter streets, and they’d have to work out, probably from emulating a seemingly wiser peer, how to cross them. Kids are encountering Facebook among other social networking sites. They are not going to revert to postcards and letters at this point. Means of communication, literacies, language, conceptions of technology … all evolve and change and there is no forcing a return to a more comprehensible time no matter how convenient that would be for parents and teachers. In fact, if we older folks want to remain relevant to kids, we have to meet them in their space (My Space?). We need to act as guides there. It is our responsibility as parents and teachers, if we wish to have an impact on how this new generation develops, to make an effort to understand what is going on with social networking, even to the point of joining in, and discoursing with people young and old from an informed perspective, offering insights gained from greater experience in life, but understanding that the world changes and those who prosper change with it. A good guide has to learn the terrain. To be a guide in Facebook you need to get an account. It’s easy and intuitive, though even I balk at installing Super Walls and accepting Vampire Bites. If you’re fortunate enough to have a fervent user in your family or distributed learning network, you might learn how tagging works with photos, or how professionals are using it to network. I found out about the recent Edublog awards ceremony in Second Life through a Facebook announcement, and Curt Bonk has started a Bonkian YouTubian Researchian network (pretty Bonkian alright - Curt, to me, is a 'seemingly wiser peer'). I’ve been teaching a course on multiliteracies for TESOL and we have been using a book written by Stuart Selber. Through another Facebook contact who discovered that Stuart had a Facebook acct and who added him to her friends list, I added Stuart to mine and he accepted. I sense that my next Multiliteracies course is going to have an interesting dimension to it as we now have the possibility of discussing the concepts with the author of the book via Facebook, can’t wait! Heather made an important point. Apart from suggesting that she get her students started in Facebook (they most likely already ARE started .. Facebook is now what we have to ask students to log out of instead of MSN, as used to be the case a year or two ago.) … but apart from that, letting them get on with it is exactly the point. If you want to hear something interesting listen to Konrad Glogowski’s K-12 Online presentation at http://k12onlineconference.org/?p=166, or what I was actually thinking of, his conversation with Women of Web 2.0 at http://www.edtechtalk.com/node/2661 where he explains how he did just that in his PhD research, got his students blogging and let them go for a month and then researched what they said about their school work. Guess what, they didn’t say ANYthing about the syllabus. BUT (and his students are 8th graders) they wrote cogently and engagingly about what interested them, and they dialoged with one another, and considered audience and argument to a much greater degree than one would expect from more traditional ways of teaching 8th graders. Konrad cited the work of Ray Oldenburg who coined the term “Third Place” in the context of being not home and not work, but a place of “broader, more creative interaction" http://en.wikipedia.org/wiki/Third_place (why, when I want to know something, can I invariably find out more about it in Wikipedia? - another social networking site that certain segments of education really need to face up to). Konrad has an interesting blog post on turning classrooms into Third Places: http://www.commun-it.org/community/konradg/weblog/454.html . So what Heather is suggesting then is creating a Third Place that might overlap a little with her class, where students could get away from the ‘work’ place (the ‘second’ place) yet co-mingle the second and third. This is what Konrad did. When he saw that his students were not discoursing on the classroom in their blogs, he started bringing up their blog posts in class, making their postings a part of the discourse of his classroom, as he put it. One of my take-away quotes from listening to that conversation was Konrad’s contention that “writing is a social artifact” – think about it, and then think about Vygotsky and constructivism, and check out what George Siemens says about Connectionism next time you’re on Google. The lesson for us is that in order to remain relevant to our students, we have to acknowledge their discourse, and absorb it to some extent into our dealings with them. To watch that boat leaving the pier and not make some effort to leap aboard, or reach it, is just going to widen the gap between us and our students. ... and regarding my previous posting, feeling experimental, a possible breakthrough in the ongoing saga of achieving long-sought recognition from Technorati that I as a blogger exist. Finally, an email from someone at Technorati apologizing for the long delay in getting back to me but they have made a small adjustment to their system and from now on but not including previous postings (that's fine with me) my blog should start appearing in their listings. No, the trick provided by David Warlick mentioned in the previous post didn't work, but if Technorati has fixed the problem, this posting should. If you find it after a search on one of the tags here, leave me a congratulatory comment! Hi folks, having a slow day in December in Abu Dhabi. Weather is nice. Bobbi and I failed in our assault on the peak at Jebel Kawr a few days back (came to the realization that at our slow pace we hadn't allowed enough days) but we have 4 days later this month and we'll do it this next time. It's a challenging climb, but doable, and we're both young and confident. Meanwhile, I'm doing some armchair experiments. First of all, I was looking for the free version of Camtasia 3.0 that Techsmith is offering. I came on this knowledge through the Webheads mailing list but have not been able to get my hands easily on retrieving the download information. For one thing, there is no announcement of this generous offer that can be easily found at the Techsmith site. Like, do they really want people to have this free software, or have they withdrawn their offer? A Google web search turns up some outdated sites from when version 3.0 was the most current, plus some software download sites offering 3.0 as a trial version still. What to do? Hey, it's new age ... what about a BLOG search? Yep, that works. Google blog search, magic. The second thing, the real impetus for my experiment here, stems from an exploration of David Warlick's HitchHikr site. I have to admit I hadn't really understood it (and why there was no 'e' in Hitchhikr). I thought it was designed to aggregate all kinds of postings associated with conferences that designated conference tags. First, someone has to register this tag at Hitchhikr and then the scripts that David has placed here go out and troll for content. It turns out that the content as far as I can see derives from Flickr (NOW I get it). I'm not sure what else the site does, still twiddling with it. But being a bit of a hitchhikr myself (especially from travels in my youth) I decided to hitch on David's site by registering writingmatrix as a conference. I was both surprised and pleased to see that the result was photos that writingmatrix students (bloggers who tag their posts writingmatrix) have put up at flickr and tagged accordingly. I also saw that some of these writers/photographers have tagged their postings dekita as well. Not suprisingly, the photos take us on a tour of Sao Paolo. By chance I came on a Technorati "Blog Tag Generator" at David's Hitchhikr site <http://hitchhikr.com/make_tags.php>, and that's what I want to try here. I entered three tags in the generator, hit submit, and was rewarded with the code appended here, which David says should be pasted at the bottom of my blog article, as is done here. The last step, after publishing this post, is to ping Technorati, and David has supplied a facility for that in his BTG. So, let's see what happens ... will it work?? Stay tuned to find out. Webheads started in 1998 as a community of language learners and teachers who began meeting online about then, at a distance, to develop their skills in the learning and teaching of writing in English. In these days before blogging and the advent of the read-write century, Webheads were enabling learners to get to know and interact with one another by posting writings on mailing lists (interactive) and websites (static) with faces of writers appearing in thumbnail portraits next to their compositions, an idea that only later became well-known as a feature in Moodle and other socially oriented educational environments <http://www.homestead.com/prosites-vstevens/files/efi/webheads.htm>. Participants in Writing for Webheads strengthened their bonds by meeting synchronously each Sunday noon GMT. At the start, meetings were in a compelling avatar-based space called The Palace, but when around the turn of the century it became possible to mount synchronous voice chat at our website, Webheads lost no time adding this new dimension to our weekly interactions, and from that time on we began attracting the attention of other online teachers, whom we invited to interact with us at first informally, but then at online events which we mounted at conferences, frequently online. But with increasing frequency we were invited to appear at face to face events to show delegates at international conferences firsthand how easy it was to engage students in communication with one another using online tools freely available over the Internet. As more teacher voices joined our community, those of the students began to be suppressed. 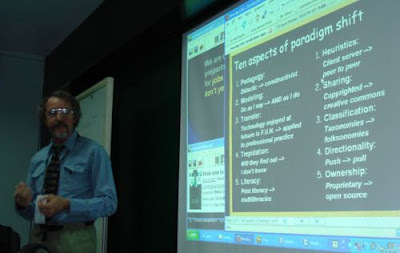 Seeing the need for separate teacher and learner groups, I formed Webheads in Action (WiA) as a session in the second TESOL/EVO annual training event in 2002. EVO, or Electronic Village Online, is a set of free grass-roots professional development seminars on various topics in language learning which take place the first two months of every year (see: http://academics.smcvt.edu/cbauer-ramazani/TESOL/EVOL/portal.htm). The timing was impeccable as WiA was at the cutting edge of a movement that was soon to define use of the Internet in the read-write Web century that had just begun the new millennium. We were yet to see the tools which would carry this movement foreward, tools such as blogs, wikis, YouTube, and the proliferation of social networking sites. Yet the impetus was well in place and that first group of teaching practitioners became a dedicated core who have for the most part remained loyal to this beginning in 2002. "Becoming a Webhead" has been offered at every EVO event since 2004, and has in each instance been put on by participants in prior Webheads EVO sessions. Meanwhile, the Yahoo Group which served the first EVO session in 2002 has grown to well over 600 members (and anyone is welcome to join at http://groups.yahoo.com/group/evonline2002_webheads). Webheads have morphed in how they perceive themselves. In 2002 we thought of ourselves as a phenomenon which had emerged online from a YahooGroup, but this feeling of group quickly developed into the idea that we were a community, and for our first few years we explored the notion that we were a community of practice. This attracted a number of studies, including a dissertation on our group by Webhead Dr. Chris Johnson, which in turn led Etienne Wenger, perhaps the best known writer and researcher on communities of practice, to alter his notions of the CoP paradigm and explain how WiA had influenced his thinking at one of our online Webheads in Action Online Convergences, WiAOC 2007 (referenced below). More recently, I have come to think of ourselves more as a network than as a community or group. I have been influenced in my thinking largely by George Siemens and his writings on Connectionism (2004) and by Stephen Downes and his numerous writings and podcasts, including his appearance at WiAOC 2007 at which he drove the point home (see also his slide show from a presentation on Distributed Learning, April 3, 2006, at http://www.slideshare.net/Downes/distributed-learning). Indeed, what Downes refers to as a distributed learning network seems to me to characterize the connections in Webheads and our overlap with a Venn diagram patchwork of other communities often largely populated by Webheads members. The question of what constitutes a Webhead 'member' often comes up. I suppose you are recognized officially as a Webhead if you have enrolled in the YahooGroup, or in the Worldbridges drupal portal at http://www.webheadsinaction.org. Or you might consider yourself a Webhead if you frequent any of the sites listed in the portal that links to all the other Webhead portals here: http://webheads.info. I tell people that being a Webhead is like being a hippy. You know if you are one. And if you are one and see another one, there is likely to be an affinity between the two of you. This notion of membership dissipates with the degree to which you consider yourself to be more a node on the network than a member of a group. The grouping is then defined by its connections, not by a particular sense of membership. In this perception, each node connects to many others and one cloud of connections might be called Webheads whereas many of the Webheads nodes might have tentacles linking to another cloud called EVO, which in turn would have nodes networked elsewhere but not necessarily directly to Webheads. To take another example, there is a cloud of networked nodes referred to as APACALL (the entity in whose newsletter this posting will soon appear), and many of those nodes reach back into Webheads. At each of our WiAOC convergences, APACALL members have interacted with Webheads as members of panels mounting presentations at those online conferences, so in a network sense, APACALL participants might feel themselves to be a part of the Webhead cloud of networked nodes, though they may not have necessarily joined the WiA YahooGroup, so they wouldn't in that sense be considered as Webheads 'members'. But they might have enrolled in the Worldbridges portal, and here would be another stimulating network, many of whose nodes reach also into the Webheads cloud. What's interesting about this is what happens with "knowledge" in a network. Downes has a 'Where's Waldo' definition of what it means to know. You don't know where Waldo is until you know, and once you know, you can't not know it. This is a personal definition of knowledge, but we can't all know where Waldo is every time we need to find him, and this is where Webheads rely on their networks. Jay Cross says in his book on informal learning that "The work of the future is knowledge work." David Warlick pointed out in his recent K-12 Online Conference keynote that whereas his father learned in college what he would need to know for the remainder of his working life, his children would have no such assurance. In a so-called 'flat' world where the jobs we teachers train our students for have not been invented yet, those most competitive in the most likely future will be those whose networking skills are most sophisticated and refined. This I think is what Webheads are about. We encourage one another to enhance our networking skills, learning the tools most appropriate for this as we use them with each other. We model for one another the most appropriate systems for enhancing connectionism and the sharing of knowledge within our distributed learning networks. As we ourselves become more familiar with the basic essential tools, we carry them into our workplaces and classrooms. As we involve our peers and students in effective ways of learning, we model for them, to try and break that cycle of recivitism, of going back to ways of teaching and learning that are becoming increasingly outmoded the further we get into the read-write century, the century where the knowledge worker will prevail. Webheads are change agents. We work on the easy part first, to change one another. It's harder to effect change with those who are not yet networked or not so committed to learning that they will pay more than lip service to the pursuit of learning full time, which is what lifelong learning is. But the secret is not in teaching, not in assembling groups of students, like horses led to water. The key is in modeling, in showing people how to successfully network, to aggregate content, to work toward the creation of folksonomies through tagging, to pull in knowledge through imaginative use of key technologies like RSS rather than relying on what is pushed their way in email spam and glut of attachments. Another key is to connect, to interact with a network, to touch base frequently with other nodes in your distributed learning network. But if you're reading this blog, you probably already know that (and if you're not reading this ... beyond reach?? ... sigh ... what's the use?). citing "a blog that allows a distributed community of practice to share their condolences with a member whose father died." This might not be the kind of knowledge you would expect to be shared in a distributed learning network promoting professional development, as it refers to a personal situation not normally discussed among professionals. Yet read on to the next post, "Miso stalks Spike," an installment in the adventures of a Webhead from Canada who is on an extended trip by van to Mexico (and whom I had encouraged to tag her blog posts 'webheadsinaction' so we in the community would be able to locate and read her posts). Next, there are YouTube videos, including one of Carla's son Dudu explaining the meaning of thanksgiving (Carla is from Brazilia but has just moved to Key West, where her son is showing off an remarkable command of assimilated language and culture). What is all this, you might ask? Not what you expected? It's another key ingredient of Webheads, from the days of thumbnails next to writings and voices in synchronous chat. That ingredient is personality. Caring about one another is the secret ingredient that has held this community together for almost ten years now. That, plus a proven track record of keeping one another at the cutting edge of educational technology over the past decade while introducing newcomers to the process in an effective and non-threatening manner. Cross, Jay. (2007). Informal Learning. John Wiley & Sons, Inc.
Downes, Stephen. (2007). Personal Learning the Web 2.0 Way. Presented at WiAOC 2007 - http://www.webheadsinaction.org/wiaoc2007/StephenDownes. Siemens, George. (2004). Connectivism: A Learning Theory for the Digital Age. elearnspace. http://www.elearnspace.org/Articles/connectivism.htm. Wenger, Etienne. (2007). Conversation with Suzanne Nyrop. Presentation at WiAOC 2007 - http://www.webheadsinaction.org/wiaoc2007/EtienneWenger. There is a full text of a late draft of my article here, though references are not included: http://www.homestead.com/prosites-vstevens/files/efi/papers/taskbase_ch10june192003.htm. Here is a Commentary: from the Linguis list, May 2005. AUTHORS: Leaver, Betty Lou; Willis, Jane R. TITLE: Task-Based Instruction in Foreign Language Education SUBTITLE: Practices and Programs PUBLISHER: Georgetown University Press YEAR: 2004 "CHAPTER TEN: Webhead communities: Writing tasks interleaved with synchronous online communication and web page development (Vance Stevens) Another instance of virtual classroom implementing writing tasks is described in this chapter. The author reports activities of groups of learners and teachers involved in online writing practices. The writing tasks were aimed at purposeful interaction and technology was a vehicle of implementing pedagogical principles not the driving force. The author's initiative for conducting an online writing and grammar course is reported to have been the starting point of this community of online writers called Webheads. The group interactions involved various topics including projects on which teachers interacted and themes and tasks of interest to learners. Cost, ease of use, multicasting capability, and cross platform adaptability were the criteria in selecting the tools for computer mediated communication. Email groups, web pages, and synchronous chat were the major modalities of interaction and implementation of tasks. After a brief discussion on evaluation and in the conclusion section the author mentions lowering affective obstacles and promoting a sense of community as the main message from the project and recommends that the model be applied in other situations. In an appendix some technology related issues are dealt with. Stevens, Vance. 2001. Developing a Community in Online Language Learning. In Syed, Zafar, and David Heuring, eds. Tools of the Trade: Teaching EFL in the Gulf. Proceeds of the Military Language Institute's 1st annual Teacher-to-Teacher Conference, May 3-4, 2000, Abu Dhabi (UAE) pp 85-101, and on the web at http://lightning.prohosting.com/~vstevens/t2t2000/gvs_t2t_paper.htm. Derek said a couple of things during the conversation that I thought were well worth blogging. For one thing he said that in New Zealand they had selected individuals in institutes to receive funding in hopes that this would enhance technology at the entire institute through a trickle down effect, but post-studies revealed negligible evidence of trickle down. This doesn't suprise me given the tendency in many institutes for there to be just one or a few people really interested in technology and the majority of people at those institutes either ignoring them or at best largely avoiding the issue. This seems to indicate that funding the norm is not necessarily conducive to the spread of technology at educational institutes and that an institution-wide kick would be needed in order to impact change. The second thing that Derek said that really grabbed me was to relate how a colleague had been studying the effects of programs of professional development and had come to the conclusion that in cases where teachers did not pursue a course of PD beyond a particular salient event, they were likely to revert to teaching in the way they had been taught within a certain number of months (was it 7? I'll listen again). Given the vogue in considering learning networks as ecologies, here is a case of ontogony recapitulating philogony, or the offspring or product of a training program reverting to features inherent in a long line of previous trainers. This is to say that something more than a one-off course or training session is needed in order to really cause change in teaching methods. Calling forth a phlosophy of Zen and the Art of Maintaining a Respectable Commitment to Professional Development, it behooves us to realize that change must come from within. It is something that must be worked at continually, through blogging and reading blogs for example, or listening to podcasts such as the one I refer to here, through podcasting oneself occasionally, and through familiarity with what is involved in doing all that in order to inculcate similar learning heuristics in students by MODELING for them, through a teacher's personal professional development habits, what techniques and methods will help keep learners (lifelong-learning students and peers) connected to professional learning networks wherein new-age knowledge resides. Incidentally, I realize that I have two lists of items numbered 1-5 (hey, do the math!). The problem is that I was not able to get Google Presentation to number a second column of bulleted items consecutively after the first. If you know how, you might leave me a comment. Incidentally, if you wish to comment, please read the latest version and leave your comment below. Soon, the version here will mirror the latest version in its temporary location. More Documents: Support for Word Documents and Excel Spreadsheets. Attendee rights: Off by default; presenter can transfer audio or video control selectively. Two-way video: You and your attendee can share each others’ live video during the session. Whiteboard Tools: The drawing and writing toolbar now includes a “Delete” button. “Undo” and “Redo” also added. New Look and Feel: Panels for chat, attendee list and audio, video settings now occupy the right side. Meanwhile still, Michael Coghlan informs me that "the latest version of Elluminate (v.8) has full duplex for up to 4 speakers if you choose to enable that feature." He says he most often opts to leave it off, and this was discussed last night at Webheads, Svetlana wanting to replicate a f2f classroom online, and me pointing out that the technology wasn't up to it because of feedback when participants don't wear headphones (moderators always having to troubleshoot that one) and also DELAYS ... in a meeting the other day we had one participant appearing rude interrupting other speakers (on full duplex) when in fact he was simply experiencing delay and was responding at appropriate junctures ... we have also experienced this when attempting guitar jams online .. impossible to synch up). A recent Women of Web 2.0 webcast http://www.edtechtalk.com/WomenofWeb2.0 (and subsequent podcast, on the Worldbridges EdTechTalk channel http://www.edtechtalk.com/) discussed the hottest Web 2.0 applications these days (obvious grist for an On the Internet column editor). Honorable mention went to NetVibes <http://www.netvibes.com/>, VoiceThread <http://voicethread.com/#home, and WiZiQ <http://www.wiziq.com/>, among others. WiZiQ currently is all the rage on Webheads and Learning with Computers, two email lists with around 1000 tech using educators interacting constantly in dozens of email messages each day (message archives viewable online or via RSS feeds from http://groups.yahoo.com/group/evonline2002_webheads/ and http://groups.yahoo.com/group/learningwithcomputers/, repectively), and it's also a popular topic in the edublogosphere. For a quick overview of WiZiQ, there's a slick promotional video on YouTube: http://www.youtube.com/watch?v=_Yty0cPzlcU. What WiZiQ is and why is it so popular with tech-crunching educators is what I have been reflecting on recently, in conjunction with the critical issue in education of who exactly is in change here?. First I should explain that WiZiQ is a free presentation software working entirely online, no download to your computer, that allows you to interact with other participants in a common virtual space. The space contains a whiteboard, which users can turn into multiple whiteboards, and upload PowerPoint slide shows to one or more of them. The slide shows are hosted more or less permanently at WiZiQ where they can be searched on by content, tags, or groupings, a feature reminiscent of Slideshare <http://www.slideshare.net/>. Users can also converse synchronously in full duplex, and if the moderator has elected to enable web cams, he or she can select one to display from participants who have theirs on. On the down side, there is no web tour, though URLs can be posted to the text chat. All sessions are automatically recorded and are available at the URL where the session was hosted. Sessions can be hosted by anyone registered with WiZiQ and anyone registered can attend any other session to which they have been invited. The system is similar to Skypecasting, where any registered Skype user can start one, and only registered Skype users would be able to attend, which seems not out of the ordinary in the case of Skype, since you need the software on your computer and a Skype ID to skype (the verb) someone anyway. WiZiQ takes advantage of registration in a way not exploited by Skype, however. WiZiQ has set itself up as a social networking site. Users can update their profiles with concepts they are interested in (i.e. tags) and presumably this will help link up users with common interests, though the system is new and (at time of deadline) we haven't yet found how a tag which many users share evolves into a more formal 'group'. The system does allow members to create and join groups, and to form networks of associations between users. For example, if you set up a session, you can choose to invite everyone in your group or limit the invitation to selected members in your network and they will all receive a message which not only informs them of your session, but to which they can conveniently reply. This is a feature that seems to work well with WiZiQ, though I have received messages from people I didn't realize I was networked with. WiZiQ is clearly a work in progress, under development, but with social networking sites, unless you directly probe the developer, many of the features will become apparent only after extensive usage and interaction. One reason that WiZiQ has attracted so much attention is that educators are always on the lookout for free tools that promote synchronous interaction coupled with information dissemination within a network, especially one that lends itself to a formal venue, such as a class or a 'presentation' online. WiZiQ is the first product of its kind to emerge since the recent DimDim effort http://www.dimdim.com/, a similar, and open source, project which somehow seems to have receded from the periscope views of the instructor networks mentioned above. In that project, network members such as Moira Hunter had been working closely with the developer of DimDim. In the case of WiZiQ, the developer Harman Singh, appears to be similarly approachable, and responds personally to feedback from users. Preferences vary, but one popular choice of an integrated set of online presentation tools has been Elluminate http://www.elluminate.com/. Although Elluminate is not free, it is often used for free by educators when they participate in sponsored or funded online conferences or sessions, or work through a community like Learning Times http://www.learningtimes.org/, which has provided free access to an Elluminate "Meeting Room" on its left sidebar for years. Learning Times has also been gracious in providing access to Elluminate meeting rooms for individuals and events which in turn provide educational services for free. For example, they have donated their services as sponsors of two WiAOC Conferences now http://wiaoc.org/. Elluminate itself has just started offering free 'rooms' to educators, but supplies each with only enough bandwidth for three participants: http://elluminate.com/vroom/. Elluminate has proven to be a very robust platform despite being heavy on the front end at low bandwidths (it checks to see if the most recent version is on your computer and takes a few minutes to install the latest, and then it checks three proxies -- your browser, Java, and Elluminate itself -- which must all be set correctly, but which you would notice only if trying to connect from behind a firewall). Once connected, it generally works pretty well. It's cross platform and fairly intuitive to use, which is to say that in practice few complain of problems figuring out how to use it. The room will have been assigned a URL, but once this is given out, guests can enter the room with or without a moderator present. The moderator can assign other moderators to share power, and can remove those privileges as easily. The moderator can also grant individuals the right to use mics or web cams. With Elluminate, speech only works one direction at a time, but this works well since it imposes a turn taking order. The moderator can also 'take back' the mic in case a participant neglects to relinquish it (resulting in too long a silence). Whereas only one web cam can be shown at a time, as long as the moderator has allowed it, participants can self-select to broadcast whenever the cam spot is available, and a preview mode allows for preening prior to going prime time. Participants also have access to a whiteboard onto which they can superimpose text, paint graphics, or image files from their personal disk drives, and a moderator can upload PowerPoint or other prepared materials, and can drive web tours in such a way that all participants visit the same URLs. Elluminate also allows moderators to share applications, for example a browser window. This differs from a web tour because with application sharing, the moderator can scroll and all participant windows will scroll as well. Unlike WiZiQ, recordings are not made automatically, but when activated the recording is hosted on Elluminate servers, where it can be played back by anyone with access to the URL. As with WiZiQ, if there is a way to save a copy to a personal computer, I am not aware of it. However, some users make Camtasia versions of recorded sessions which can serve as personal archives or be hosted privately <http://www.techsmith.com/camtasia.asp>, and word on the street is that TechSmith has released the only slightly outdated version 3 of Camtasia Studio as a free (as opposed to trial) download: http://www.downloadsquad.com/2007/11/22/techsmith-offers-free-camtasia-studio-download/. Camstudio, the open source version of Camtasia, should work just as well <http://camstudio.org/>. Elluminate lends itself well to a variety of styles of presentation. It works well with informal groupings where people just want to meet and discuss while sharing collaborative resources, and it works well for people who want to make more formal presentations but open participation to more audience interaction during or after the presentation. In my experience I have never thought it necessary to restrict anyone's access to the tools while moderating a session, though I have attended sessions where moderators have preferred to lock it down and force participants to request attention before being granted access to the mic once the moderator had notified them that such requests would be attended to (when the moderator has wished to restrict access during the presentation itself). Elluminate allows participants to raise hand icons to request attention, to clap hands, present a thumbs up or down, and control various other emoticons and graphical whiteboard icons as well, again assuming these have been allowed by the moderator. Elluminate, in other words, works well for moderators who wish to encourage peer to peer collaboration throughout a session, as well as for moderators who feel the stakes are high enough for them to exercise enough control to enable them to stage-manage an event. However, what I have been reflecting on with regard to these two applications -- WiZiQ and Elluminate -- is not so much the descriptive differences between them, but the philosophical ones, the assumptions behind what a presenter's purpose would be which must have driven design of each system. What particularly interests me is WiZiQ's approach, so different from that of Elluminate, to the role of the presenter/moderator. Two other differences have been mentioned and are not really part of my reflection, though each is an important crucial difference in its own right. These are the fact that WiZiQ is free and is being developed obviously in hopes of attracting a following, and presumably feedback such as I am providing here, and secondly its social networking features, very interesting, but not a focus of this review. A WiZiQ session develops very differently to an Elluminate one. First of all, the moderator will schedule a session, as is the right of anyone who has registered with WiZiQ beforehand. At this stage the moderator can elect to enable the web cam feature for the upcoming session in addition to voice. The moderator can schedule any amount of time for the session up to two hours (and I believe that once in the session, the moderator can top up the session with more time if needed). However, the role of the moderator in WiZiQ is very different from that of the moderator of an Elluminate session. Most crucially, in a WiZiQ session, the moderator must be pro-active in driving the interaction from the point of appearing on time for the session to begin with. Let's say the moderator has scheduled the session for noon, and has invited a number of participants from his or her network. Those people will receive an email saying that the session begins at noon, and no one, not even the moderator, can enter the session before then. The moderator is then in a position of having to upload materials to the whiteboard with participants present who have been informed that the session was to begin at noon. One way to avoid this would be to not invite anyone from the moderator's network, so there would be no system-generated emails, and the moderator might then invite participants through a separate network to arrive for a presentation set to begin at 12:30, or whenever the moderator expects to be ready. However, this would obviate benefits inherent in the social network features, so what is needed here is the ability of the moderator to get in beforehand and set up the session. WiZiQ allows for fully duplex voice chat, as you get with Skypecasts, which start similarly to a WiZiQ session. WiZiQ at least deals with one problem with Skypecasts - in WiZiQ participants arrive muted until granted permission to speak. This is both bane and boon, boon to the moderator who is the sole participant who is able to speak until he or she decides to start granting others the mic, and bane in case the moderator is not there for whatever reason. In that case participants must text chat, as there would be no one available to allow them to talk. With Elluminate, it should be recalled that participants who gather at a working Elluminate room will be fully voice empowered unless a moderator arrives who wishes to switch them off. Because of its simplex, one-person-speaks-at-a time functionality, Elluminate users do not encounter the problems faced by users of Skype and WiZiQ when everyone is able to talk at once -- these issues being background noise and feedback. With Elluminate, it might also be recalled that users in general need little or no training in order to participate, but with Skype and WiZiQ considerable time and effort often has to be expended on mic etiquette. Users of duplex synchronous voice chat tools need to wear headsets so that their mics don't pick up what others are saying from the speakers and feed it back into the voice stream with delay, giving an echo effect that can disrupt speech in the person trying to speak. In worst cases, this can cause high-volume whine until the offending user self-mutes or is muted. Similarly when participants are in an area with loud background noise, they need to mute their mics when not speaking so that the noise doesn't distort the conversation being played to everyone else. If the moderator has to deal with sound issues while trying to present, this increases task load, so a course of least resistance for moderators is to simply leave the default settings in place, so that everyone but the moderator is muted. The moderator then opens up one mic at a time in response to a hand raised, the icon provided for participants to get attention. Similarly, if the moderator has activated web cams for the session, then the moderator's web cam will appear from the moment it is switched on, but for others to have the cam, the moderator must select that person and pass web cam control on. If the moderator is on the ball, this might be a good way to ensure that anyone who is speaking is pictured while speaking, but then the moderator would be taking on a role of director or puppeteer, constantly switching between speakers and web cams by granting the appropriate privileges at just the right juncture in the presentation. Another odd thing happens in WiZiQ when the moderator grants voice permission, and that is that permission to use a microphone brings with it permission to have moderator control over whiteboards, including the option to create new ones and toggle from one to another. It's hard to second guess the developers of the product on this one, but the ramifications are several-fold. In particular, the moderator cannot grant many participants microphone privilege without a corresponding increasing in chance of chaos occurring with whatever presentation materials are on the screen. If the moderator stopped on a particular slide for example and invited comment and then threw the floor open to all participants, all participants might start seeing the slides and whiteboard changing without anyone knowing who was making the changes, and when the moderator regained control there might be a few whiteboards more than when the chaos started. So it must have been assumed in designing this system that the moderator would not think to do this. In our experiments with this system we have found that the moderator would be in any event unwise to un-mute all mics due to the sound issues mentioned earlier, so the system seems to have been designed with less flexible view of how a moderator might want to conduct a session than that allowed by Elluminate. What then must a moderator do in order to make an effective presentation in WiZiQ, and what would a group do in order to hold an effective brainstorming session in WiZiQ? These are important questions to raise at this time, while WiZiQ and perhaps other similar products are under development, and while the developers are still in a position to respond to feedback from the educational community. In its present rendition, WiZiQ is designed for a moderator who wishes to have control. In practice, that moderator is kept a bit busy to be both moderator and presenter. There are a lot of balls to juggle, trying to sort out the duplex audio issues, manage the web cams, plus toggle the whiteboards, in addition to making a presentation which entails conversation with participants. Even in Elluminate, where moderation is not quite so hands on, moderators find it convenient to work in tandem, one person presenting and another handling the back channels. This is possible in Elluminate because one moderator can appoint another (but is not yet an option in WiZiQ). It might be wise for WiZiQ to go the same route, and provide this option to the main moderator. Also, it would help to allow moderators finer control over privileges, instead of bundling such a wide set of privileges with anyone who is able to use a microphone. So to answer the first question above, to make an effective presentation in WiZiQ, the moderator needs to keep control of it, and this is best done by withholding control from others, or by being careful and abstemious in how that control is parceled out. In my experience with similar tools, and due to my idiosyncratic personal learning and presentation style, I do not take as great pleasure in participating in discussions where participants are not free to interject as in those where they have this right. Here preference of style would be a matter of personality, but with Elluminate one has the choice of adopting the approach one prefers. With WiZiQ that choice is made of necessity. As to the next question, how best to run a brainstorming session with more relaxed participants, WiZiQ would be a good choice for this because it is free, and would likely be adopted by members of a community, who might also wish to take advantage of its social networking aspects. In such a community, where members would interact over time, they would likely get to know one another and would educate each other in proper use of the tools (how to mute mics and wear headsets for example). WiZiQ appears to me to have its strengths in situations which would benefit from access to social networking tools, and connectivist philosophy. So if one were to make the choice right now which client one were to choose, it would depend perhaps on how much money one had (WiZiQ is free), how high the stakes were within one's community (Elluminate is more stable and robust, and more flexible with regard to role of moderator), and whether or not the social networking possibilities with WiZiQ were worth exploring. WiZiQ is developing an enthusiastic following, and as part of a community of users that includes its developers, the possibility at this juncture of influencing the course of development is additionally encouraging. Perhaps this article can contribute to the development effort. In order to encourage feedback I have blogged it at http://advanceducation.blogspot.com/2007/11/whos-in-charge-here-wiziq-and.html. If you feel you have anything to contribute to this discussion, please visit the blog and add your two cents, and/or leave comments at the 'official' WiZiQ blog at http://wiziq.typepad.com/. You can also subscribe to Elluminate blog reviews at http://www.elluminate.com/rss/blogs.xml. I'm Vance, and I aspire to doing significant work in the area of educational technology as it applies to formations of what I used to think of as communities of practice but which I am now starting to view more as distributed learning networks. My oeuvre explores the nature and ecology of those networks through application of emerging (also referred to as ‘transformational’ and ‘subversive’) technologies in appropriate ways to the intersections of the knowledge within those networks and the pedagogies that are felt to best impact students (e.g. constructivist, connectionist). Stevens, V. (2014). Connectivist Learning: Reaching Students through Teacher Professional Development" in Son, J.-B. (Ed.). Computer-assisted language learning: Learners, teachers and tools. APACALL Book Series Volume 3. Newcastle upon Tyne, UK: Cambridge Scholars Publishing. http://www.cambridgescholars.com/computer-assisted-language-learning/. My more recent work has involved Web 2.0 technologies and the many ways, such as through RSS and the blogosphere, that content can be tagged in evolving folksonomies over the Internet and then aggregated in such a way that it becomes knowledge within a distributed learning network. I have been exploring with likeminded peers and students, often students in the online environment, how this knowledge can be most effectively distributed throughout our respective networks, and how these networks can merge into broader yet ever more inclusive wide-networks. Access to such networks requires an expansion of 20th century concepts of literacy into multiliteracies models. I have been working extensively within a multiliteracies construct, teaching courses on the topic, and practicing wherever possible multiliterate approaches to information dissemination throughout my own learning networks, including those of my face to face students. I have sought to be a change agent, achieving some measure of success in the broader distributed educational community, while making some inroads in the more local one where I work. Locally I've had perhaps most impact on my own students, where I have been able to model for them heuristics that they can pursue in their own quest for knowledge in a world where the jobs we are training them for haven’t been invented yet, and where the information needed to perform those jobs must be gleaned from online communities of practice which in turn filter content through distributed learning environments, and aggregate and remix this content into knowledge applicable to whatever real-world environment our students find themselves in when they need to perform tasks they desire to do in a decreasingly predictable future. Application of the expertise to do this requires an evolution in perception of pedagogy that I feel that educators are tending to, at a greater pace in some parts of the world than others. Whenever possible I try to take advantage of opportunities to help others to reflect on their practice and consider possible applications of technology to enhance their ability to achieve whatever they are trying to accomplish in the classroom, whether it be from a teacher’s or learner’s perspective. That's my current theory at any rate, but I expect to be changing it due to unforseen developments in the near future, which I'm hoping I'll be equipped to adapt to through appropriate perspectives on knowledge acquisition and dissemination that I am trying to understand and apply today. So when I found this blog guess what?? 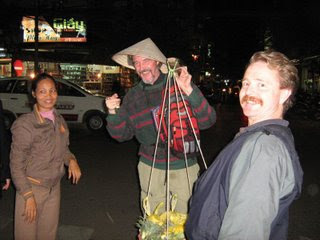 (checks out the blog …) Looking good in that Vietnamese hat! Doris: What a small world!!!! Are your guys blogging and tagging? How are your guys finding blogs to follow? Doris: Yes... but how do you cope with teaching a syllabus and teaching how to work all these tools at the same time...? Me: did you hear Konrad Glowgowski's talk at k-12 online? someone said "I love to learn, I just hate to be taught"
Doris: that's what I meant by going with the flow... sometimes we want to control everything and have plans we can to carry out perfectly... we have to learn to relax and go with prior knowledge... trust each other..
How about your students? Can they learn through self motivation? School no longer prepares you for a predictable future. Doris: my guys are working... and they will start demanding more of what they have been using sometime... we have to wait for the right time... so everything runs smoothly...? I have just published the slide show of the first presentation. This is the first time I have used Google Docs Presentation. I am blogging the slide show to see how it looks. Hi Folks, I've just returned from a week in the states. Busy week, I settled my parents' affairs and bought their house off my siblings, so in a week I became once again a home owner. But my inlaws will move in there, so I hope not to be involved so much in home maintenance. Well that's another story. Meanwhile, back here in the UAE I'm waking up at 4 in the morning, which is good because it's a great time to blog. But I'm also falling asleep on the floor of my office at 4 in the afternoon, which is also good, because cat herders like catnaps occasionally. There, a link to this post should now appear in the one above. The presenters play with boundaries through the simple expedient of having student bloggers in different countries tag their blog posts with the unique tag term writingmatrix. Searching on that tag in Technorati, the student bloggers in four locations in three different countries have managed to locate one another's posts, leave comments for one another, and have subsequently interacted in other ways as well. The presenters explain how they started the project and how it has branched into other online and even face to face activities involving the students in the participant countries. The presentation is made not only through the voices of the presenters, but with the students themselves lending their voices through their blogs and videos. Now, I'll wrap up this post with a couple of discoveries. The first is the Jing project from http://www.screencast.com. This is a tool, free at present but perhaps for a limited time only, produced by Techsmith, the makers of Camtasia and Snaggit, which captures images or videos from your desktop in a very nice interface, easy to use, which allows you to save the capture either as a swf file which you can keep as a file on your computer OR as a hosted file almost immediately available. To give you an example, I wanted to show Nelba how Technorati now allows you to calibrate the authority of the posts you view. The problem was that we would tag our posts 'writingmatrix', and have our students tag them the same, but only a few of those posts would appear when we would search Technorati for posts with 'writingmatrix' as their tag. In fact, the default search on tags with Technorati is to return hits on posts with 'some authority', and this returns ten posts at present on Technorati when you search on 'writingmatrix'. What a morning. It's truly the dawn of a new day out there. I've got to get to my more mundane daytime job now. This turned out to be one of those challenging experiences. In the belief that the file could be no larger than 20 mb I chipped away at it in Audacity till the mp3 rendered down to 19.5 mb, but still couldn't get it to upload through the Podomatic website. I think it was uploading, it was just taking a long time, but in the process of working out what the problem could be I discovered that Podomatic allows you to FTP your files, and once they are at the site, you select from a list of the files you have there to post them to your podblog. That makes it much easier, so it was a nice discovery. As I said, I spent the best part of a day on the process but I feel I learned a lot and become somewhat more multiliterate in the process. Hope you enjoy the podcast. Now that I know how to streamline things, I'll try and clear my backlog. Stay tuned (RSS would be a good way to do that). The Writingmatrix group Vance Stevens, Nelba Quintana, Doris Molero, Saša Sirk, and Rita Zeinstejer will present “Motivating Student Writers by Fostering Collaboration through Tagging and Aggregating” at the K-12 Online Conference http://k12onlineconference.org/?p=100. According to http://k12onlineconference.org/?p=83 this year’s conference is scheduled to be held over two weeks, October 15-19 and October 22-26 of 2007, and will include a preconference keynote during the week of October 8. This year’s conference theme is “Playing with Boundaries.” Along the lines of our presentation, content related to the conference can be aggregated at http://www.technorati.com/posts/tag/k12online07. A Moodle page at http://www.opensource.idv.tw/moodle/course/view.php?id=23. A big problem with the Moodle this time around is that due to an incompatibility between the most recent versions of Moodle and the SQL dbase running on the server that's graciously hosting us in Taiwan, backup no longer works here, so I'm hesitant to put much effort here until this is resolved. Something new, and interesting, a PageFlakes portal at: http://www.pageflakes.com/vancestevens/13498617 . I find I like working with PageFlakes. It has an easy and intuitive interface - you simply select widgets and embed them in your page. One of these works on RSS feeds, so you can display recent content on your PageFlakes portal of whatever sites you want to follow. The course is about how new literacies are emerging through increasing digitization of communications media and seeks to inculcate the concepts not through a top down explanation of what multiliteracies is or are, but by empowering participants with a familiarity with the tools and through use of these tools stimulate them into making discoveries about how these tools might be applied to their own social and professional lives. These lives overlap of course, learning being essentially a social phenomenon. The problem in beginning this course ... and I'm not sure about this, I'm only speculating ... but the problem is that it takes a while for participants to 'get it'. But when they do 'get it' it's transformative. That is, the light comes on, and perception of Internet and how it potentially can be used is indelibly altered. So what is there to 'get'? The course is only a few weeks long. Therefore, participants have to jump in and use the tools. Traditional courses in the TESOL series are run through a Desire to Learn portal. This structures courses didactically; that is, the 'teacher' will propose material to be absorbed in a certain order, and interaction with students takes place through threaded discussion lists. Some but not all students are familiar with LMS/CMS, learning/courseware management systems. Prior experience with LMS/CMS not withstanding, the instructional model is familiar and intuitive, so most courses plow ahead within this paradigm. I found the D2L lists to be robust in my first rendition of this course but I had assigned a text to read, and this was a good way to discuss it. Still I wasn't happy that we were truly exercising the concepts that we were scrutinizing. Threaded discussion lists are derivative of print media. They are effective in the exchange of prose discourse. But multiliteracies implies much more than that. In the years that I have taught this course I have evolved my understanding of what multiliteracies are and how best to learn about them. After the second year facilitating this course I abandoned the printed text (i.e. demoted it to optional reading). The main reason for this was that it was not available to all participants, but also, besides becoming dated, as an instance of print media, it was bogging us into talking around the subject. I felt there was more to be gained from doing not as we said, but doing as we did. I was meanwhile developing a greater understanding myself about how blogs worked and were organized around folksonomies, and how they could be plumbed for knowledge in a distributed learning network. Last year, my third teaching the course, I had each participant not only keep a blog, but follow each other's blogs through Bloglines. This could almost have replaced the threaded discussion lists in substance though perhaps not in logistics, so we continued to do both. This year however, having gained even more experience through the writingmatrix project, and also having heard a couple of David Weinberger's excellent presentations on how folksonomies can be utilized to draw information from meta-tagged Internet resources, I decided with this year's course to take last year's concept a step further and base the most current syllabus on interactions among participants through aggregation of tagged blog entries. In order to do this I had to issue each participant with a set of tools. But as facilitators are mere cat herders in distributed learning settings, to issue here means to offer, and not all participants are at first predisposed to appreciate the importance of what is being offered. Here is the rationale behind what I have in mind. First, I feel it is crucial to the development of community that participants get to know one another, and for every other rendition of this course, I've created a community page with everyone's picture and brief biodata. However this year I decided to set up a wiki for that and encourage the participants to fill in their own spaces. Now several days into the course, some of the participants are starting to do that; e.g. In setting this up, one page per participant, I took it upon myself to tag each page pp107tesol (among other things; the complete tag set I used was aggregation, call, folksonomies, multiliteracies, pp107tesol, social networking, tesol, wikis - and participants are welcome to augment and alter this as each feels befits his/her own page). I also proposed a set of readings to start us off which included my own thoughts on multiliteracies and especially my collaboration this past summer with Barbara Dieu, a colleague with a good understanding of aggregation and tagging and how it can be used in encouraging students to collaborate and enjoy each other's blog postings (see http://tesl-ej.org/ej41/int.html). Bee (as Barbara is known in the online communities she frequents) applies her understanding of how this works to her http://dekita.org/. These readings would allow students to see how my thinking on the topic had evolved and where it was going. I augmented this with an assignment of literature in other media, to view the very interesting debate between David Weinberger and Andrew Keen, at http://conversationhub.com/2007/07/09/video-david-weinberger-and-andrew-keen/. Here Weinberger explains how information on the Internet is organized around folksonomies, to which Keen is able to counter that this is all a step in the wrong direction in the organization of repositories of human knowledge and intellect. I then proposed that each student in the course start a blog and weigh in on this debate in a posting which would be tagged pp107tesol. We can look for postings tagged pp107tesol at Technorati, by searching on http://www.technorati.com/posts/tag/pp107tesol. There are ways we might need to fine tune here, and we will explore such considerations as we proceed with this course. We can comment on each other's postings and see to what degree this kind of conversation can supplant or augment our other threaded discussions. We can tag each other's postings in http://del.icio.us and explore together how social bookmarking works. It is interesting for example to tag your own URLs and see who else has read and tagged them as well, and what other tags they are using. The tools by which this takes place need to be acquired now. The main tool is to have a blog of some kind, and then to tag postings in that blog so that they can be found by others looking for posts tagged pp107tesol. Secondarily comes the content of this course, which is to understand how this fits into a framework of multiliteracies. It is hoped that reflection on this content will provide the impetus for making numerous postings in participants' blogs, which will give the rest of us something to aggregate. As this system gets under way and is activated for each of us, we can begin to see how classes or other work or study projects can be organized on these principles. Once this awareness is achieved, participants in the course will have 'got it'. And I hope this will provide some clues as to where I'm heading with my course development so far. There is a method to the madness after all nyaa haa haaarrr!